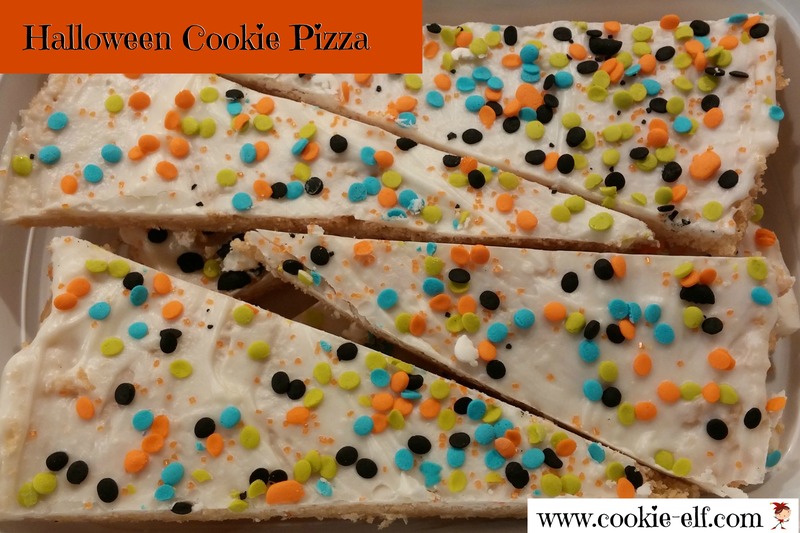 Halloween Cookie Pizza is a fun and easy cookie recipe that’s a sweet variation on traditional pizza … one you can adapt for any holiday. Decorate the pizza with sprinkles (as pictured here) or candy corn or even autumn-colored sugars like red, orange, and yellow that are appropriate for this time of year. Cookie Pizza is a perfect treat to make for Halloween parties! Get the full recipe for Cookie Pizza and get more ideas for easy cookie recipes on our Easy Cookie Recipes Pinterest Board. Candy coating products (like Wilton’s Candy Melts® and CandiQuick from Log House®) are used to make candy, drizzle over desserts, create sweet dips, and coat cake pops. Once the candy product is melted and applied to the cake, cookie, or dessert, it hardens easily. Sprinkles and decorations adhere readily. That’s one reason why candy coating products are useful as “icing” on Cookie Pizza – candy is easy to use and leave a firm shell, so cookie pizza surfaces are not sticky. Follow directions on packaging for melting. Most often, melt on half power (50%) at 30 minute intervals, stirring after each interval. Do not over heat candy coating. Do not add liquid to candy coating. You can thin the consistency by adding 1 teaspoon of vegetable shortening or vegetable at a time, stirring thoroughly. Use gel, powdered, or other oil-based food coloring to tint candy. Use oil-based candy flavoring to alter candy melt taste. Store leftover candy coating product in a cool, dry place. Do not refrigerate or freeze. Candy coating products are available in several different flavors and colors. Find them in the baking aisle of your grocery stores. See more helpful and interesting baking tips on The Elf’s Baking Tips Pinterest Board .